Berryman Public Auction — Harritt Group, Inc. The Berryman’s, longtime heating & cooling contractors, have sold their home and will sell the following Ford Ranger Pickup, vintage motorcycle, tools, appliances, collectibles and household items. Auction located East of IN-62 in Edwardsville or West of Main Street & St. Rd. 111 in New Albany. 1997 Ford Ranger XLT 2WD regular cab short bed pickup truck with V-6, auto, air, crimson red, only 69,780 miles. 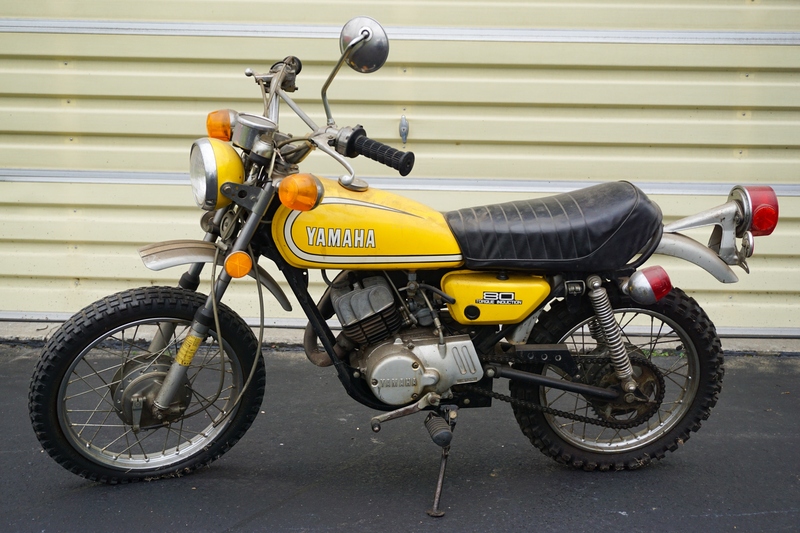 1970’s Yamaha 80cc Mini Enduro, original condition, 3365 miles. Cub Cadet 528 SWE zero turn power steering snow blower w/low use, Cub Cadet self propelled lawn vacuum w/bagger, Troy-Bilt Pony rear tine tiller, STIHL FS75, Troy-Bilt TB22 & Echo GT-200R trimmers, STIHL 015 chainsaw, (3) Lawn Boy push mowers, Dayton torpedo kerosene heater, Protemp heater, gas and electric pressure washers, Craftsman 30 gallon vertical compressor, large aluminum vertical rolling cart, John Deere lawn cart, ATV ramps, aluminum & fiberglass folding and extension ladders, appliance dollies, Craftsman tools, pipe wrenches & cutters, electric & propane heaters, vise, grinder, large selection of copper & brass fittings, roll of copper pipe, scrap & more from 40 years in business. Men’s Columbia “Arlington” & Huffy 314 10-speed bikes and (2) Nishikis men & women’s 10 speed bikes. Leather tan sofa, love seat and chair, (3) cloth recliners, microfiber loveseat, queen size bed w/new custom mattress, tv stand, coffee & end tables, 1930’s buffet, antique organ stool, (2) electric organs, claw & ball foot lamp table, blue wicker furniture, cedar chest, dresser, twin size bed, painted dome top trunk and more. Like-new Frigidaire Affinity front load washer and dryer w/stands, Whirlpool washer and dryer & Whirlpool side-by-side refrigerator. Rheem Heating and Cooling clock, 24” porcelain Coca Cola button sign, kraut board, Royal & SCM Smith – Corona typewriters, dozens of LP records including Kiss, James Brown, Johnny Cash and Chuck Berry, rotary phone, child’s abacus, TY Beanie Babies, vintage Barbie dolls and accessories, vintage board games, Coca Cola collectibles, (3) large boxes of MLB giveaway helmets, reproduction Studebaker service sign, Coors Light lamp, vintage New Albany cross directories, large stereo speakers, retro starburst wall clock, (2) outdoor concrete lions, Brulin 55 gallon oil drum, school lockers, Thomas Kinkade Christmas houses, glassware, figurines, art, IU memorabilia, teddy bears and much more. Turbo Poker 25-cent video poker game, Panic Sarus slot machine, complete Nintendo NES Sports Set, (2) NES consoles, multiple extra NES controllers, NES gun controller, NES games in original boxes include unopened Harlem Globetrotters, Super Mario Brothers 2 & 3, Dr. Mario, Pac-Mania, Pinbot and Monopoly, other games with manual and no box include Tetris 1 & 2, Codemasters, Shooting Range, Classic Concentration, Othello, Anticipation, Wild Gunman, Wheel of Fortune, Casino, Pac Man, Super Mario Brothers, Duck Hunt, Ring King, Dribble – Dribble, Rock N Ball, Major League Baseball, Jeopardy, Win, Lose or Draw and Mario Brothers and (2) Game Boy classics. Kitchenwares, glassware, small appliances, cookware, seasonal decor, file cabinets, desk, linens, prints, lamps and many more common household items. I-64 to Edwardsville Exit#118. West 1/4 mile on St. Rd. 62 to left on Corydon Pike. 3 miles East to auction on right. Or from West Main Street and St. Rd. 111 intersection in New Albany take Corydon Pike 1.3 miles West to auction on left across from Pineview Drive.